« Consulting A Consultant… FREE 15-minute session offered! Perhaps any other interviewer in the world may have been indifferent to that name in this day and age. I, however, knew better– as a teenager I had written to Ms Kirby and requested an autograph. I had owned the record albums and I knew the records. I also knew that she had suffered a turbulent life and that just made her records more exciting. I was never much of a fan of the other blustering female singers of that generation. Shirley Bassey was not my thing. Kathy Kirby was a different thing altogether. Almost infinitely better looking than her contemporaries and certainly more talented… It was hard not to love her records. So, what happened? She isn’t remembered as the others are remembered. We hear CIlla Black on the radio every other day, and we hear the dramatic cries of Shirley Bassey every day, but unless you buy the records you won’t hear Kathy Kirby. So when Mark approached me for an interview, to say I was excited was an understatement. I already knew she was a great woman, the two large autographed photos she’d sent me were proof of that. I almost wish I’d sent her my copies of her albums to sign now! 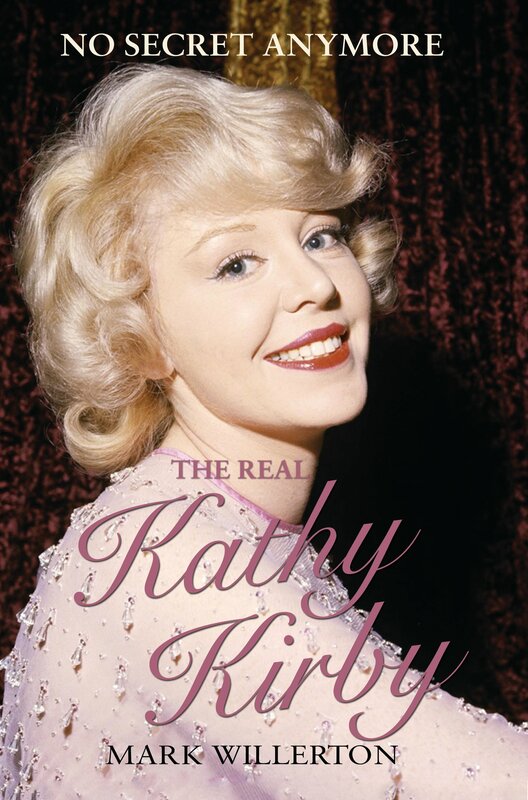 Enjoy this interview as Mark discusses The Real Kathy Kirby: No Secret Anymore. Q) Hi, Mark, let me start by telling you how much this interview means to me. I was a huge fan of Kathy’s as a teenager and I still am. So, what made you decide to write this book about Ms Kirby? A) Despite Kathy Kirby being one of the most popular faces on British television during the 1960s, her death didn’t even make the TV news bulletin. After thirty years out of the public eye, she had become a forgotten name. I thought Kathy needed a definitive biography, not only to remember her accolades when she was the ‘Golden Girl of Pop,’ but also to address the fact that Kathy also had problems, through no fault of her own, and that is why she was forced to ‘retire’ so early. Q) I have to ask, Mark! How did you meet Ms Kirby? A) Quite by chance really. Mark Littlemore, a friend of mine, had formed a new fan club for Kathy in 1981 – the year she embarked on her final comeback. Kathy was appearing in Skegness and Mark invited me along to the show. I actually went just to meet up with Mark again and to support him in his new role, rather than to see a faded pop star of the 1960s. But from the moment Kathy appeared, I was just swept away by her voice and stage presence. Afterwards, Mark took several of us to the stage door to meet Kathy, and soon after we spent an afternoon with Kathy at her London flat. I saw Kathy again a few weeks later when she appeared in cabaret in Lincoln – it was on this occasion that she gave me her phone number, and so began a friendship that lasted almost thirty years. Q) What are your personal memories of the 60s music scene. Did her music interest you as a teenager? A) I was a child of the 60s and my sister, being seven years older than me, bought all the latest pop records by Billy Fury, Cliff Richard and the Dave Clark Five, so I was always aware of the current hits in the Top Ten. Dad liked country music, particularly Jim Reeves, while Mum favoured The Bachelors and Vince Hill. My favourite singer was Cilla Black and I also had most of the records by Dave Dee, Dozy, Beaky, Mick and Tich! The Ferguson radiogram in our front room was in constant use. I was of course aware of Kathy Kirby, she was always on TV … but all that lip-gloss and glamour was a bit OTT (over the top) for a schoolboy! At that time, Kathy didn’t interest me at all, which is amazing. If I had only known then, that fifteen years into the future she would become one of my closest friends. Q) What kind of music and which performers did Ms Kirby favour? A) Kathy had eclectic tastes depending on her mood. During her teenage years, she was greatly influenced by Doris Day and saw all of Ms Day’s films as soon as they were released, learning the words to the songs off by heart. Mario Lanza was another idol of Kathy’s and his film ‘The Great Caruso’ remained one of her all time favourites. In her later years, she loved listening to recordings made by Ambrose and his Band in the 1930s. The late Bert Ambrose has been her mentor, manager and lover. She felt close again to Ambrose when she listened to his music. When Dean Martin died, she re-discovered his back catalogue and found his style very relaxing. Julio Iglesias was her favourite male singer. His phrasing and Spanish vocals reminded her of her time in Spain during the late 1950s before she became well known. Judy Garland was another artiste she admired. There were two singles in Kathy’s collection that I often found on her record player turntable – a very worn acetate of ‘Delilah’ by Tom Jones and ‘I Get a Kick Out of You’ by Gary Shearston. But Kathy was also impressed by modern day singers such as Michael Buble and Will Young. One day we listened to the Amy Winehouse album ‘Back to Black’ and Kathy loved it, particularly ‘I’m No Good’. “Bert ( Ambrose) used to say I was no good,” she said with a wry smile. Q) How do you feel about the way she has been remembered? A) Now that is a question! In a word – frustrated. 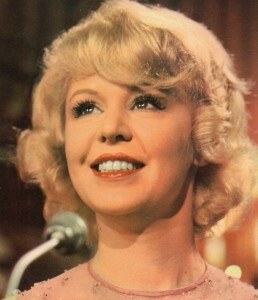 It seems like Kathy Kirby has been airbrushed from the British pop scene of the 1960s. It’s partly due to the fact that Kathy seemed to just disappear following her final comeback during the early 1980s. But during the past thirty years she has been totally overlooked by music historians and researchers. Just recently, a TV programme about entertainment in post-war Blackpool failed to even name check Kathy – with no mention of her sell-out summer season at the Winter Gardens in 1967. During her final years, it must have hurt so much to be ignored when she had once been such a huge star. Whenever female singers of the 60s are mentioned in the media, it’s always the same names … Dusty, Cilla, Sandie, Lulu. Now don’t get me wrong– these ladies deserve recognition and they recorded some super songs– but Kathy was right up there with them. Q) Do you believe your book sets the truth straight and takes away from the opportunist newspaper articles written about Kathy Kirby over the years? A) It wasn’t the newspaper articles that caused concern, but the rife speculation about Kathy’s private life that began to appear on the Internet as soon as she had died. Statements came from people who didn’t even know Kathy, repeating gossip and hearsay. Being a key figure in Kathy’s life, I thought I was best placed to set the record straight. I had witnessed the comings and goings of various friends, the arrival of Kathy’s family back into her life after a thirty-year rift, and the problems she had faced with money worries and illness. I thought it was also important to bring in the opinions of others to the story giving those closest to Kathy the chance to put forward their own version of events. Q) How was the writing process for you? Did you find that you were a natural writer or is it quite difficult for you? A) I know that I’m not a natural writer and I would struggle with another project, but I found writing about Kathy easy because I knew the subject so well. For almost a year, I was up at 5am most mornings and would then spend a couple of hours on the book. That’s when I felt at my most charged and enthusiastic! The words just seemed to flow, and by writing about her, it was my way to come to terms with the loss of such an important person in my life as I didn’t go to Kathy’s funeral. Kathy’s niece, Lady Sarah Thatcher, made the funeral arrangements and none of her aunt’s friends, including myself, were invited. Researching Kathy’s early years and even her period of fame, I found out so much that I didn’t know before. The second half of the book is a memoir, so recalling the various highlights of the years I knew Kathy was a joy; but I also had to recall the more desperate times in her life when she became a recluse and suffered with schizophrenia. It’s a ‘tell-all’ book, but I was mindful to write about Kathy’s mental health problems with compassion and understanding. She was so strong to cope with such debilitating illness. The memoir section has caused the most reaction. 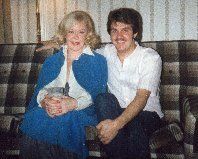 Fans have noted that this is when the real Kathy Kirby emerges– and many have said they felt as if they were in the room with Kathy when I recounted some events– they now feel like they actually knew her. I really enjoyed the research, writing the book, selecting the photographs (there are 80 pages of rare colour and B/W images), being hands-on with cover design and layout. But the marketing aspect is the one part I don’t like and where I fall down. I know it’s a must when self-publishing, and I admit I’ve been rather lazy so far! The book also has an appendix – a full UK vinyl discography and values; plus a complete listing of Kathy’s radio and TV appearances ( including the songs she sang) which was compiled by Ian Parkes. I should really mention Ian as he put a lot of time and research into it! Q) Do you believe Kathy Kirby could have been a bigger star than she was? A) Kathy was one of the biggest stars of her generation. The highest paid British female singer of the mid-1960s. But in terms of longevity, I think Kathy’s days as a top-liner were always going to be numbered. I like to think that she could have reached superstar status like Dame Shirley Bassey – certainly, their penchant for big emotional ballads was very similar. In hindsight, and what we now know of Ambrose as a manager, he didn’t always make the right career decisions for Kathy. He was one of the old school and the songs he chose for her were often plain old-fashioned. He was locked in a time warp. Although it was the swinging 60s, he favoured standards and songs from the 1940s. He famously turned down the chance for Kathy to record ‘You’re My World’ which was subsequently offered to Cilla Black and her disc topped the charts. Ambrose also took Kathy away from the BBC for a better deal with ITV, which ultimately fell through. There was also the issue of Kathy’s fragile mental state. I doubt that she could have coped with international stardom. Q) Tell me about the real woman beneath the image. What was she really like? A) Kathy was exciting, funny, mischievous, charismatic, forgiving, quirky and thoughtful … as well as being truly impossible! There were two sides to her character. She could be headstrong and assertive, standing her ground with her favourite expression: “No one tells Kathy Kirby what to do.” But she could be vulnerable and naive, too, with a subconscious need to be ‘controlled’. The control aspect began with Ambrose back in the late 1950s and after he died in 1971, control shifted from one to another over the years. She seemed to attract that kind of person, right up until the end of her life. Kathy could be demanding and expected loyalty, but if you were lucky enough to become her friend (and stay the course!) she repaid loyalty two-fold. Kathy had a handful of close friends and those that did know her all thought they were her ‘best friend’. That is such a compliment, as she made each one of us feel needed and special to her. Despite the many unfortunate events in her life, which included bankruptcy and being made homeless, she wasn’t bitter and could even find humour in her situation at times. Q) What actually happened to Ms Kirby when her career faltered? A) Kathy was so hopelessly in love with Bert Ambrose that she allowed him to shape her career the way that he wanted – and she seemed to like it that way. When he died, part of Kathy died with him. Without Ambrose, her heart just didn’t seem to be in it. Kathy went from one manager to another, bookings became less and the venues became smaller – even singing between bingo sessions at one point. With increasing mental issues, she became unreliable, work dried up which ultimately led to bankruptcy. There was one final comeback in 1981. By late 1983, Kathy was struggling to hide her demons and although it wasn’t a conscious decision, she just drifted into early retirement and obscurity. Q) Do you think there is any similarity between the stories of Kathy Kirby and Dorothy Squires? Both seemed to have tragic lives. A) The two singers had almost parallel lives. Like Kathy with Ambrose, Dorothy had a controlling partner in songwriter Billy Reid during the early years of her career. Into the 1970s Kathy was rarely seen on TV due to misunderstandings with BBC and ITV executives and Dorothy was blacklisted, too. They also struggled to receive any airplay for their latest discs. In temperament, Dorothy possibly had the edge. Apparently she could be quite fearsome! Female singers had it so tough in those days. If they demanded that everything was just right, they became labelled as ‘difficult’. Dot and Kathy also faced the indignity of bankruptcy and lean times in their latter years. The two singers were blessed with a loyal fan base – still very much in evidence today for the both of them. Q) It has often been said that Kathy was ignored by the music industry during her years in decline. I would like to ask you if the music industry ever reached out to offer their help to Ms Kirby? A) Show-business is such a precarious profession. When a star is on the rise or at the top of their game everyone in the business wants to know you or be associated with you. When a star begins to fall, it’s the opposite. No one wants to know you, as if misfortune might be catching! Kathy never formed any lasting friendships with show-business colleagues, partly because she was rather shy offstage and because Ambrose never allowed her to socialise. When Kathy was made bankrupt and homeless in the late 1970s, she was detained in St. Luke’s Mental Hospital in Muswell Hill, although the judge later admitted his decision was a mistake, as he thought St.Luke’s was a hostel. Whilst Kathy was there, she received support from 60s singer Sandie Shaw, who was a regular visitor. Susan Maughan, another 60s contemporary, offered Kathy the chance to stay at her Brighton home if she ever needed accommodation. Sir Paul McCartney showed Kathy kindness with monetary support when she was totally broke, which she never forgot. One day an envelope arrived, containing £500 in cash, with a note ‘Linda and Paul would like to help in some way’. Kathy had only met Paul a few times during the 1960s and broke down in tears, deeply touched by their generosity. Q) Do you think she has been treated well by current releases? Do you believe her music ranks with the best singers of the era? A) Kathy’s hits have popped up on the ‘Dreamboats and Petticoats’ series which are CDs of 1960s artistes which have become best-sellers during recent years. These collections can only help to keep Kathy’s name in the public eye and introduce a younger generation to her work. A few years back, I compiled three CDs for the Vocalion label which contained the rarer tracks that Kathy recorded for Decca and EMI. Kathy was involved with the selections and the first of the three titles. ‘Hits, Rarities and Lipgloss’ proved to be her all-time favourite collection of her work on CD. I’d hoped that a definitive ‘Best of Kathy Kirby’ CD might have been released since Kathy’s death to include her dynamic theme to the TV series ‘Adam Adamant’ which has been notably overlooked by compilers when previous hit collections have been issued. There has also been speculation over a number of unreleased tracks that Kathy recorded for the Decca, EMI, Orange and President labels. If the masters do still exist in record company vaults, it would be wonderful to hear them on CD. Kathy’s fans have been starved of new material for too long! Q) If you were going to educate one person about her music, which of her songs do you think would do that job effectively? A) There are so many. How many can I suggest? For a sample of Kathy’s highly emotional style I’d choose ‘The Way of Love’. Sadly it never became a hit, but remains a classic in Kathy’s back catalogue and a favourite with fans. The theme from BBC TV’s ‘Adam Adamant’ demonstrates Kathy’s vocals at her most powerful in a James Bond style arrangement. Kathy was probably the only other female singer at the time with the voice to challenge Bassey for a Bond title! Q) Do you think she would have turned “You’re My World” into the huge hit it was? A) ‘You’re My World’ has been heard for nearly fifty years and is ingrained firmly as Cilla Black’s song, but I think Kathy could have offered a great rendition of the title, too, maybe bringing a little more sensitivity to it. Just compare Dionne Warwick’s ‘Reach Out For Me’ (penned by Bacharach and David) to Kathy’s version, which was released on her second EP. Kathy brings warmth and sincerity to the song which is somehow lacking in the Warwick version. But back to ‘You’re my World’ – it would have been great if Kathy could have at least covered the title for an album or as an EP track. Connect with Mark on his Facebook page. The Real Kathy Kirby: No Secret Anymore is available on Amazon. To me Kathy Kirby was the Greatest singer of her Generation ,with talent like hers she will never be forgotten where others will pale into insignificance , Her diction and bell like quality of her voice the light and shade and emotional quality she brings to her songs not only did she have hit records but proved her versatility singing such standards Like “Body And Soul”,,”,”Someone To watch Over Me” and “The Man I Love” and the songs of the great composer’s George Gershwin , Cole Porter, Jerome Kern and Rodgers and Hammerstein real songs with real lyrics; songs that will stand the test of time,songs that will never be forgotten just like the great lady herself and the wonderful music legacy that she left us with. I totally agree! It had been sometime since I had heard her records. The moment I got them back again- I was hooked! Wonder if anyone has ever heard Kathy signing “Your the answer to everything” what a song, the lady belts it out with great gusto. The song could have rivalled Secret love had it been released as a single, can’t understand why such a fantastic song would never have been released, it would have kept Kathy’s career at the top. I wish she could have recorded a James Bond theme. What a come back that would have been.